At the epicenter of three explosive forces in 1950s America—the birth of Bebop, the spread of Buddhism through the counterculture, and Beat revolutionizing of poetry and prose—sat Jack Kerouac, though I don’t picture him ever sitting for very long. The rhythms that moved through him, through his verse and prose, are too fluid to come to rest. At the end of his life he sat… and drank, a mostly spent force. These records became very difficult to find for many years, but you can now purchase an omnibus CD at a reasonable price (vinyl will set you back a couple hundred bucks). Alternately, you can stream all three Kerouac albums free on Spotify, above in chronological order of release. If you don't have Spotify, you can easily download the software here. 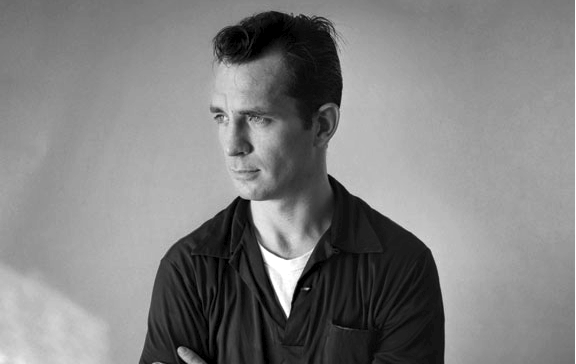 And if you'd rather hear Kerouac's readings on CD or on the original vinyl medium, that's cool too. However you experience these readings, you should, at some point, experience them. Like all the very best poetry, Kerouac's work is most alive when read aloud, and most especially when read aloud by Kerouac himself. The Steve Allen piano in the background was improv throughout….they walked through a few lines and Allen just “winged” it on first roll of tape….Steve Allen was a great talent and one of the most prolific songwriters of his day….he essentially created the Tonight Show format and hosted many of the best upcoming comedy and musical talent….like Carson did in later years….Frank Zappa played a bicycle on The Steve Allen show.